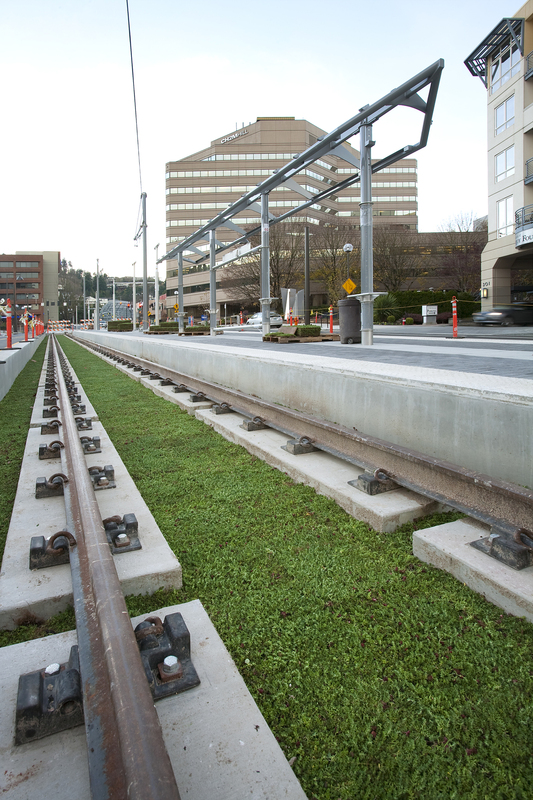 The Portland-Milwaukie Light Rail Transit Project is taking sustainable transit further with a pilot installation of eco-track on SW Lincoln Street downtown. 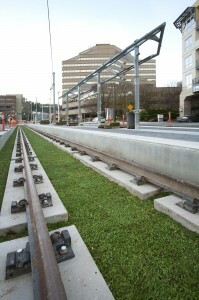 This vegetated trackway will provide a colorful carpet of low-growing plants along 200 feet of light rail line, on either side of the Lincoln St/SW 3rd Ave MAX Station platforms. Although “green” or “grass” trackways exist in Europe, it’s a rare application in the United States. The eco-track provides a vegetated trackway area pervious to stormwater, thus reducing runoff. The eco-track is comprised of 1” thick mats with various sedum species. Installation between the rails and within the trackway took place over the weekend. Check out the time lapse video of the installation produced by prime construction contractor Stacy and Witbeck, Inc. In addition to the eco-track installation, the light rail project has replaced removed trees and is incorporating sidewalk stormwater planters on SW Lincoln Street.